Here are 4 pictures of the planned side by side rig with folding masts. The above pictures (click once or twice to enlarge) shows the rig set up for reaching in light wind. Both sails are in clear wind. The boat has lee helm. The skipper can relax and enjoy. The above picture shows the boat close hauled in light wind. Compared to a tandem set up the sails are much better separated thus giving better flow and sail efficiency. The above picture shows the boat reaching in strong winds. When a boat with a mast in the centerline is reaching the sail and boom is off center unless its a square sail. By folding the lee mast the balanced lug sail will much like a square sail be centered avoiding excessive rudder action. The unstayed mast guaranties no chafe; a good thing on long passages. The above picture shows the boat close hauled in strong winds. In real life the sail will be reefed to suit wind conditions. One mast is folded to reduce wind resistance and to lower the center of gravity and mass moment of inertia. When using the lee mast there be more weather helm, desirable when you like to forereach witn little sail area up. Using the mast on the wind ward side gives less weather helm. It also reduces the tendency to dip the boom in the water. As a bonus one can also move the sails forward or aft by tilting them. The side by side rig gives the prudent navigator many options and eliminates the need for autopilot or selfsteering. I also do work on Yrvind Ten. Presently it is the boooring job of filiting and taping all the pieces of plywood and composite that makes up safe stovage space. Rig choices belong to the domain of aerodynamics, right – wrong. A cruising boat is much more complex than a racer. The more complex a structure is, the more interference there is and nothing is so difficult to deal with as that. But there is also a positive side to complexity and it is that it gives the designer many possibilities to use one element for different purposes. At first one would not think that the placement of a hatch would influence the choice of rig and normally it does not but when one is designing a ten feet circumnavigator a new set of problems comes up. To deal with storms the interior of my boat is divided into two parts by a watertight traverse bulkhead. The boat has one dry section and one section where saltwater will do no harm. The wet section is in the forward part below the hatch. The two compartments are each about five feet lengthwise. Previous experience has thought me that hatch openings of 40 cm wide and 45 long is convenient. 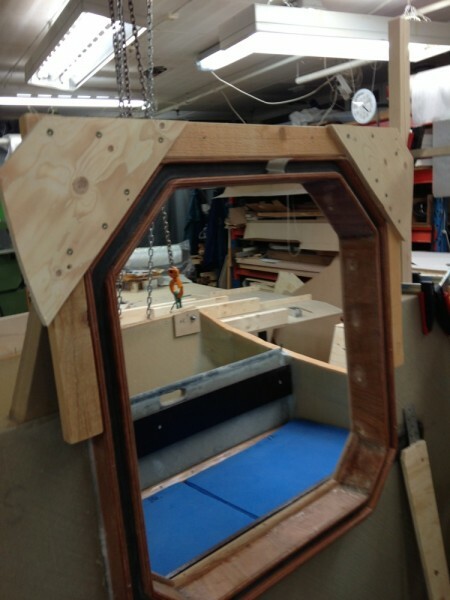 Add 5 cm around for coamings gaskets and labyrinths and the hatch will be 55 cm long – closed. But a hatch that cannot be opened is by definition not a hatch so to make it operational I had to find an unobstructed place for it more than a meter long. That place must be close to the masts, otherwise handling of the sails has to be done from deck and that is not convenient in rough weather. From one hatch it is impossible to reach two masts if they are arranged tandemly. An eight year old girl understands that. That creates a problem. I have solved that problem by arranging the masts side by side and placing the hatch between them. That way I can use one hatch to serve the two masts. An other advantage – now I can open the hatch because there is no mast in front blocking it – in other words the hatch is in the middle of the boat but the masts are on its side. Lifeline stanchions are usually 50 – 60 cm high and pretty useless. My center of gravity is 90 cm above the deck. If the lifeline is going to have a chance of doing a good job of keeping me aboard it should be at least one meter high. My masts are strong and high and situated on the boats side they are there in a perfect position to be used as stanchions. This is a good example of how one element can be used for two different purposes. Now I can have lifelines one meter high or more and they will be extremely strongly attached. Mast placed on small boats centerline blocks the passage for and aft. A pathway in the middle of the boat with high strong lifelines and masts at each side to support you makes moving around safer than the narrow side decks found on a small healing boat. An other dual use of the side by side masts is that the forward end of the awning can be attached to them. The awning protects against the sun but the main purpose of that piece of canvas is to catch rainwater. A funnel and a hose will conduct it to polyethylene jerry cans. I will be able to store about 70 liters of water, enough for two months. My side by side pivoting unstayed mast will not use tabernacles. I will put the fulcrum on the chine between deck and sidedeck. That chine is very strong, it only needs to be beefed up locally. The bottom end of the mast will be fixed to a semicircular track on the rub rail. This arrangement is stronger than a tabernacle has less air resistance and its center of gravity is lower. The mast can pivot 20 degrees forward and 20 degrees back. 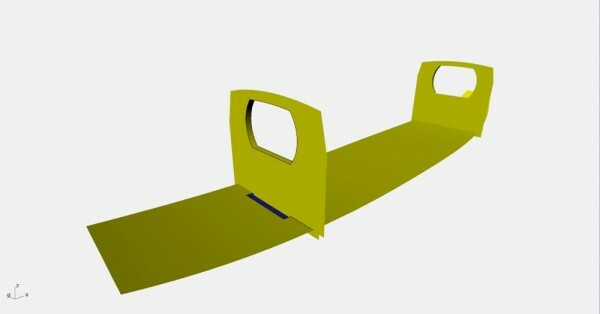 It can also be folded 90 degrees backwards to be stored along the deck in strong winds. Naturally I will be glad if my novel rig also can propel the boat. A small cruising boat is a complex thing and I may have made mistakes somewhere along my thinking. Although untried I am willing to bet on this side by side rig. Racing boats are designed with racing rules in mind. 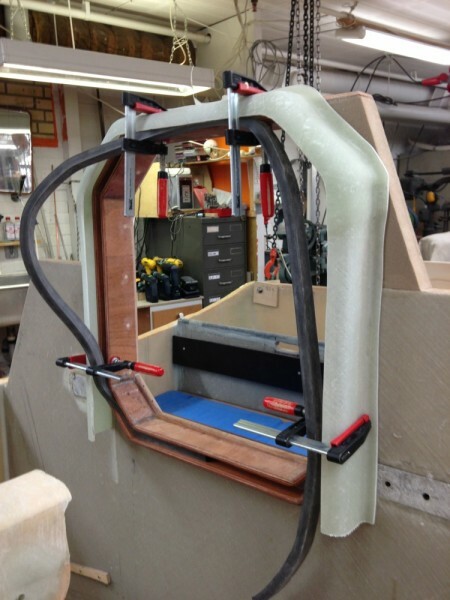 Consequently the almost universal custom is to design rigs in such a way that you get maximum effort per sail area. That implies tall rigs with one mast. I see it differently. I am not racing therefore I do not worry about efficiency per square meter sail area. I design for the shortest possible mast. A deep water cruiser have to withstand the seas worsts fury. When it starts to blow a boat with a short mast is much more weatherly than one with a tall mast because the top part of a reefed mast is not only useless it also creates drag, top hamper and slows down the boat. A short mast is not only much stronger than a long one it will also be subject to much less forces. In heavy weather it wins hands down. Out there, far from shelter, the fundamental task is to survive. Nice weather is no problem for me because I like to spend time at sea. My strategy is to hang on when the wind is contrary and ease the sheets when it starts to come from a more favorable direction. A small boat will not go to windward over ground better than 60 degrees. 60 degrees means twice the distance sailed. Windward sailing also means half the speed. In strong winds the difference between the speeds you make running and beating is even bigger. That means it will take you at least four times as long sailing upwind as downwind. You cannot have a rig that is efficient in both strong and light winds; I have chosen efficiency in strong winds. My weapon: one short mast standing and the other one folded on deck and big, big lateral areas. The balanced lug sail is very interesting because it is only attached to the mast by its halyard. The mast does not even have a track. By pivoting my mast 20 degrees the masthead mows about three feet for or backward. By moving the downhaul the same distance along the deck the sail can be moved parallel to itself six feet along the deck. That is 60 % of the boats length. That way I can choose weather or lee-helm in any wind strength. 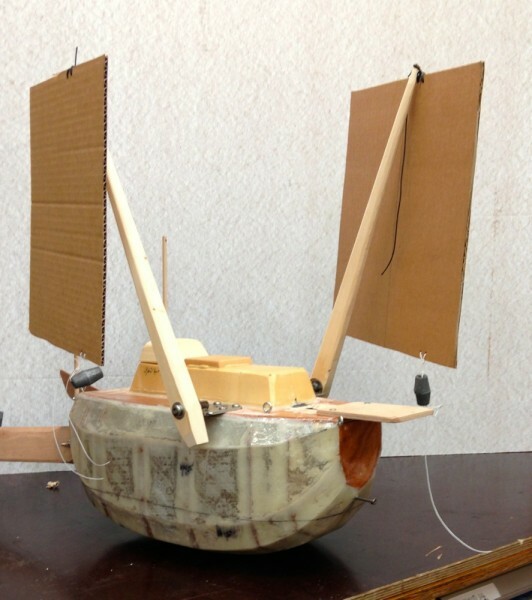 Production boats with fixed masts and ballast keels are designed with weather helm. They do not have the option of giving their boat lee helm. Obviously sailing downwind with weather helm is fighting the elements. A seven year old girl can understand that. Trade wind sailing is down wind sailing and on a boat with weather helm the rudder have to be used all the time because the boat is not directional stable on that course. If I had not had pivoting masts on my side by side rig, then when the apparent wind is on the beam one sail would blanket the other. Now it is easy to separate the sails for maximum wind exposure; I just move the lee sail a bit forward and the windward one a bit back. Problem solved. In strong winds sailing downwind I will fold the lee mast. I will use the sail on the windward mast. Its center will be close to the center of the boat. Think square sail then move the mast not the sail to windward. That reduces the rudder force and hence the resistance. If desired I can move the downhaul forward. That will give me a lifting force. Also the windward mast keeps the boom more inboard making it less likely to dip into the waves when the boat is rolling to lee. However if I would like to ride out a gale slowly forereaching I can use the lee mast because that will give me lots of weather helm for a small sail area. A boat forereaching does not roll much. It also by definition moves slowly so dipping the boom into the water is no worry in that case. It is much more to write about side by side masts and their interference and integration with a small boat but now I will stop and hopefully come back to the subject at an other time. You should newer be the first one to try something new, nor should you be the last one to hang on to something old. If you like life tranquille follow that advise but it will not make you into a trailblazer. The picture below shows the scale 1/8 modell sailing with the mast in tandem position. The aft mast creates unavoidable downwind turbulence. 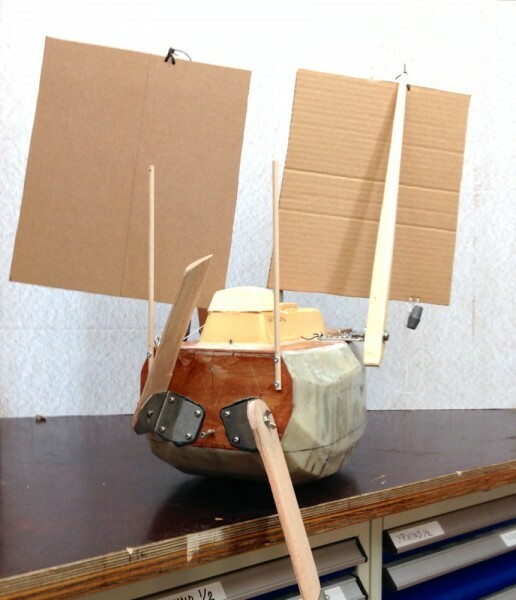 The picture below shows the modell in light wind with the masts in side by side arrangement. Both mast gets nice clean air. 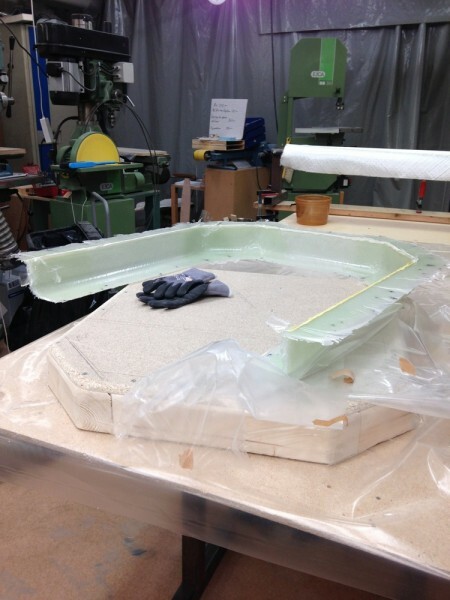 Here are some pictures showing work on the hatch in the bulkhead. Taking off shape to make shore the thing fits. It fits and very lucky I can change the gasket with the retainer/drippedge in place saving much work and making it less complicated. Sometimes but not often things goes faster than expected. While at it here is the solution for next boat. The drawer effect: This is what we engineers call the nuisance when a drawer gets stuck in a chest of drawers and it does not only happen to drawers; it happens to most sliding things that are wider than deep. It is a pain. To avoid it I made an analyses and it turns out that the solution is surprisingly simple. Drawers that are wider than deep have little guidance and therefore not always move straight but turn. When they turn the short side of the drawer is not any longer parallel with the guiding sides. The drawer takes more space and gets stuck diagonally. The more you pull the worse the drawer gets stuck. I said to myself: what geometrical figure does not get wider when it’s turned, obviously the circle, by definition. I use part of a circle as can bee seen on the illustration below. Today I also written sermon and put it in “BOAT IDEAL” One of the other blogs on my website. You find it at the startpage. I have now started a new blog on my site. Under the heading “Boat Ideal” I will from time to time note my thoughts on a desirable cruising boat. Things I learn from mistakes on the present project and ideas that come to my mind. The present boat is made to set a world record. It will never be a good cruising boat. Let this be warning. I am grateful to Sharpii 2 for commenting on my “Next Boat”. On my web site I will start a blog for her titeld ”Boat-Ideal”. It will replace the blog “Lecture”. When building and sailing I always have the next boat in mind. When doing a mistake on the present one I say to myself “that I will correct on the next one”. And it helps; my boats have over time become better and better , very much better. I am very grateful for comments and for persons helping me pointing out my errors as it is difficult to objectivly observe oneself. However that is not always easy becouse often I do not express myself clear and English is only my second language and I am dyslectic, all which add to the confusion. There is also an other aspect and that is values. Most often my values differ as to comfort, speed, use of engine and more. Here engineering principles do not apply. I will here try to do a bit of clarifying concerning sail area and speed. 1974 I sailed 20 feet 1.3 ton displacement Bris from Jamestown St Helena in the South Atlantic Ocean to Fort de France Martinique in the North Atlantic Ocean, necessarily crossing the Doldrums. Bris had no engine; not even an outboard. I could have put up more sail but chose to use only 4 square meters. I enjoyed the passage. The 3800-mile passage took me 45 days from anchor up to anchor down. That is an average speed of 85 miles a day or 3.5 knots. I found the voyage pleasant. The sail area/displacement was 3.4 if I have done the numbers right. 2011 I sailed the 15 feet 0.9 ton Yrvind.com 2900 miles from Madeira to Martinique. It took 45 days 64 miles a day 2.7 knots. The wind was more variable often so light that a candle could stand on deck without flickering, still the boat made 0.5 knots and steered herself downwind. 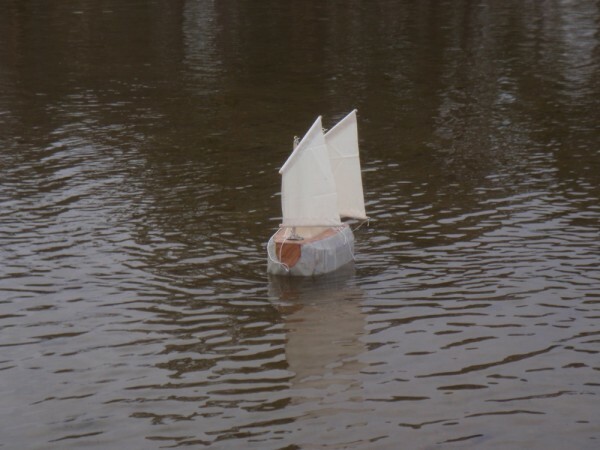 I used very little sail. Most persons would be unhappy to sail at 2.7 knots. Me I was happy to spend six weeks at sea instead of three weeks. Me, when eating, I do not try to get the food down as quickly as posseble, me when making love, I do not try to get an ejakulation as quick as posseble, then why should I try to cross an ocean as quickly as possible? I am not racing. I am cruising. I enjoy being out there on the big, blue, wet, deep, endless ocean. Still “Next Boat” has two 4.6 s.m. sails. In light wind going to windward I intend to use them if desireable so Sharpii 2 can double the number he got for “Next Boats” S/A relation. Sharpii 2 prefers sails his in tandem. That’s the common way. I differ, I think its more advantages to have them side by side like, the early airplanes, instead of one sail in front of the other becouse then they interfere less with each other. A lugsail is only attached to the mast at the top. As the mast are pivoting I can move the mast top back 1.5 meter and forth 1.5 meter and with it the sail moves. Then I move the downhaul back and fort along the deck to suit. That way I can give the boat weather or lee helm as desired. As to preventing leeway, the hull is five beams long and has very flat sides. In a way it works as a battering ram. It has very little frontal area compared to driving force. Norman Skene in his original book on yacht design always calculated lateral area as a function of midsection. Now it is calculated as a function of sail area. I do not agree. When heeled 20 degrees the leeward side present a lot of area to the water. Some of it will flow under the hull. That takes much energy. That energy creates a vortex floating along the bottom up to windward. Healed the bottom presents a bigger curve to the flow than the side making the water flow faster there. Bernulli says, the energy in a streamline is constant. This is classical two dimensional wing theory. High aspect wing have a tip vortex that disappears behind the wing. Low aspect bodies edge vortex sweeps over the surfaces combines with the fore and aft flow increases the particles energy. As the energy is constant in the streamline that energy is creating lift. That’s why the concord airplane could fly with an angle of attack of 45 degrees. Ordinary foils stall at 15 degrees. Its not efficient on the other had here we are recycling energy so its ok. This is my thinking on the leeboard and of course I lift them up sailing down wind. The rudders have even higher aspect ratio. And of course I do not sail flat downwind. I always have the wind 15 or 20 degrees on the quarter. It getting late but more will come. Michael has been busy working on the models. Here are some more screenshots. The leeboards angle of attack has ben reduced to 3.5 degrees which is satisfactory. 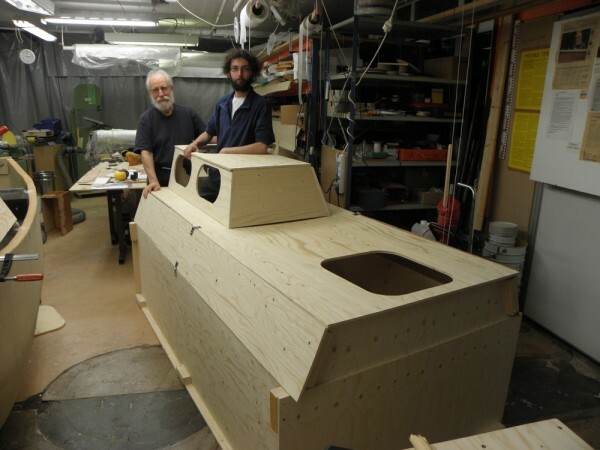 Hatches and ventilation system has been added. No water will now enter even if the boat is capsized. Of course she is self righting to 180 degrees heel. Keels, centerboards, daggerboards, chinerunners, and leeboards prevent leeway. Only leeboards makes no resistance downwind. A cruising boat spends a lot of time running downwind at anchor and in port. Click on the pictures if you like to enlarge them. I have changed the mast arrangement on Yrvind Ten. The two side by side masts is not longer connected by spreaders. A darling has been killed; there has been some give and some take. I deeply regret that I no longer so easily can climb the masts and that I lost strength. What I have gained is: the whole system is now much lover down and the hinge pin secured in a simpler way and as can be seen on the picture above one mast can be lowered if desired in strong winds. I have decided its an over all gain. Also I can give the two mast individual rake in light wind so that with the two sails up the do not interfere. 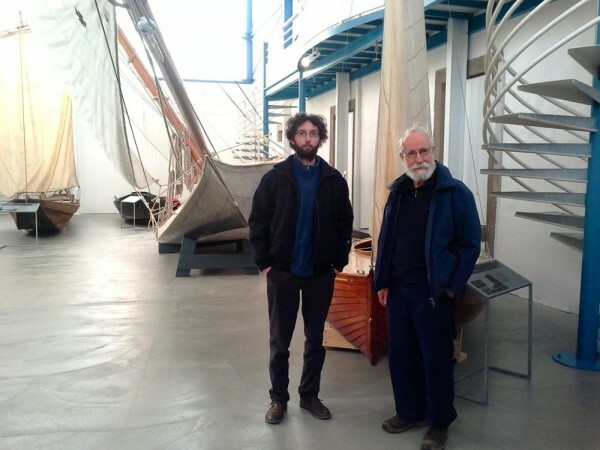 We have also been working on Pierre’s and mine next boats. They are small cruisers; here small refers to displacement not length. 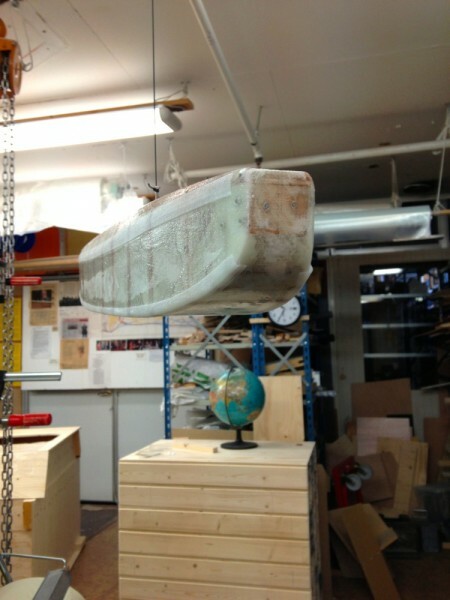 My next boat has half Yrvind Ten’s displacement and nearly twice its length. 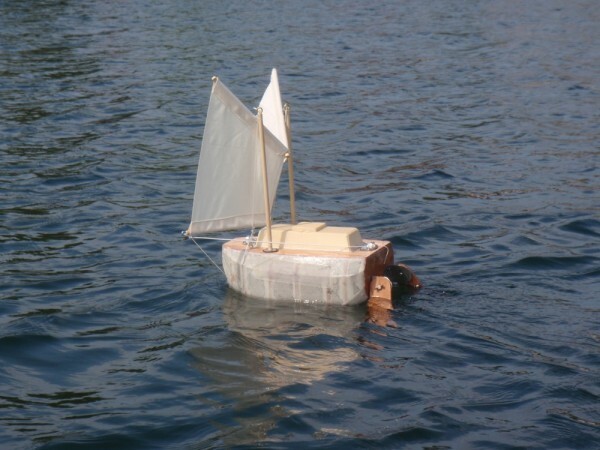 Pierre’s boat is a bit different mine is shown below going to windward in a breeze one mast up. Abouve going downwind in light air. Thanks; yes we forgot to raise the leeboard. Things like that happens when you are excited and in a hurry. A BOAT WITH DESIRABLE QUALITIES. What you desire is a question of taste. Production boats are not to our taste. 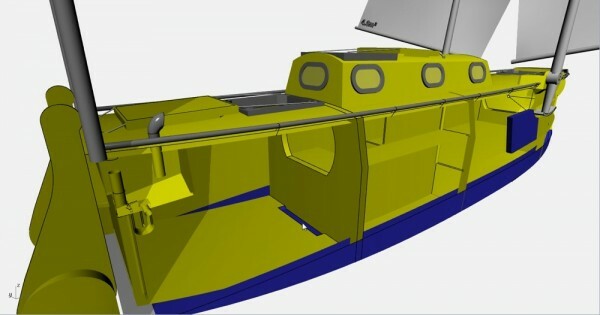 We like a boat that is small cheap and functional, have shallow draft, can be propelled by wind, wave and muscle power, a boat that can ride out any storm at sea and at the same time protect you from the weather, a boat that is directional stable upwind and downwind so that it do not need your attention. This long and narrow boat meets these demands. 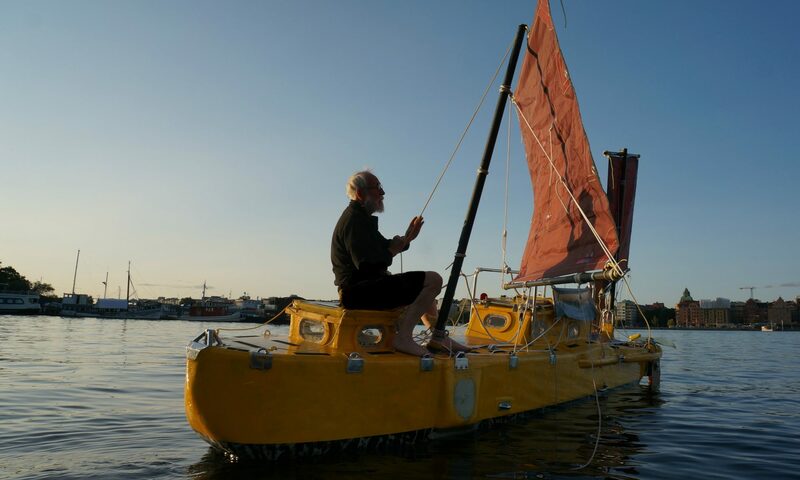 Pierre’s boat is 5,6 meter long with a displacement of 778 kilos, my is stretched to 5,8 meter and have a displacement of 806 kilos. They have the same square midsection and a prismatic of 0,723. The draft is tolerable 19 cm or 7,5 inches. The boats have balancing lugsails. There are two pivoting side-by-side mast and leeboards. The mast and leeboards pivot on the same axis. 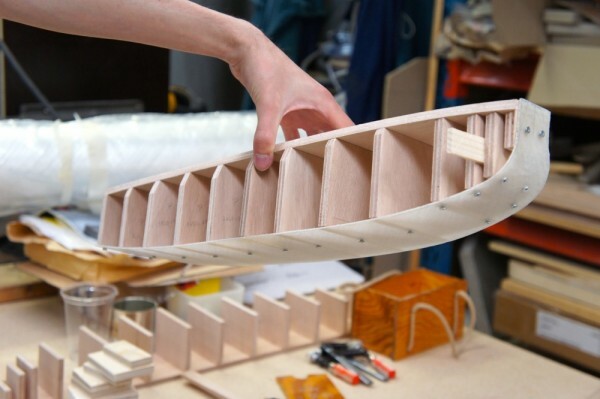 Because the section is square the leeboards will lay flat against the hull. Because the boats are small, they will attract small forces. 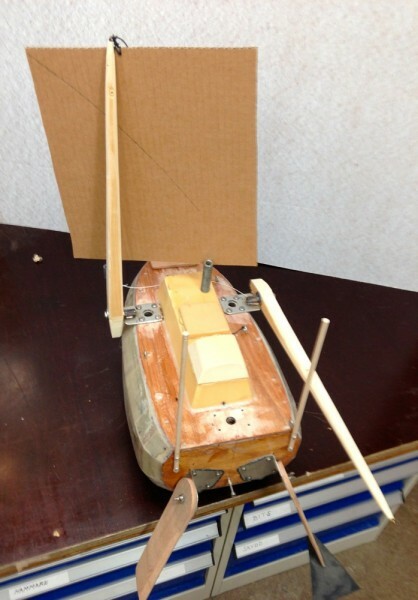 The same mast and leeboard arrangement will not work on a bigger boat ( Galileo’s square-cube-law ). 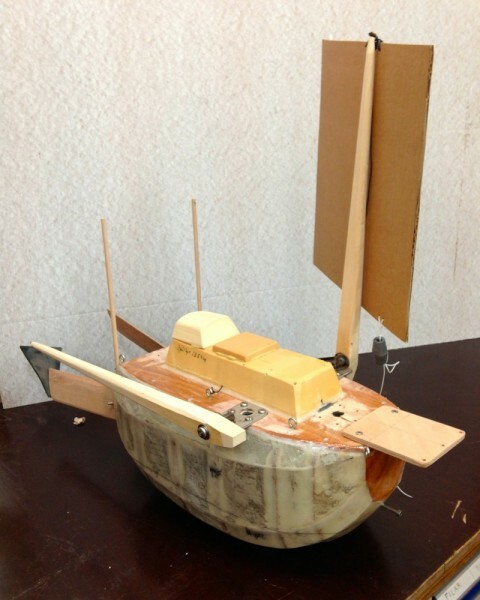 This is the beginning of a project and as yacht design is an iterating process many changes will be made. Only the imbecilely never changes their mind. One reason I like you to know this is that so that you will not think that my Yrvind Ten is a good cruising boat. She is twice as heavy has twice the draft and half the speed. Yrvind Ten is made to set a world record. She will be good at that and give me a unforgettable time at sea far from land. Pierre and me putting the modell together. 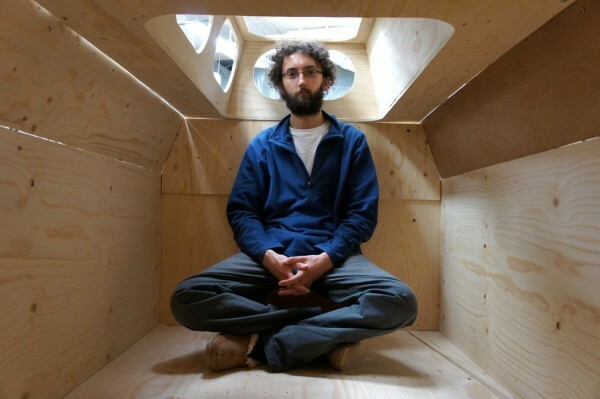 Above: Pierre inside the boat. The inside measurment is 1 meter. All that space comes from the square section. After we had found a good way to do the book, Pierre, Maelle his girlfriend and me drove back to Sweden. Here I gave Pierre more material for the book. Pierre liked my boating concept so we decided to do a design that he could build; a design that also would suit my future needs. Restricting a boat to ten feet is only good for records. I believe a boat should be long narrow and have shallow draft so my next one will be 7.2 meter long 1.1 meter beam with a draft less than 0.2 meter, displacement one ton, displacement lenght ratio 80 compared to yrvind tens 2500 . Pierre’s will have the same midsection but will be 5.6 meter long and have proportionally smaller displacement . More about this is to follow – of course I will continue to work on Yrvind ten – just made some important improvement on the rigging. Above me and Pierre at the mock-up of the midsection. 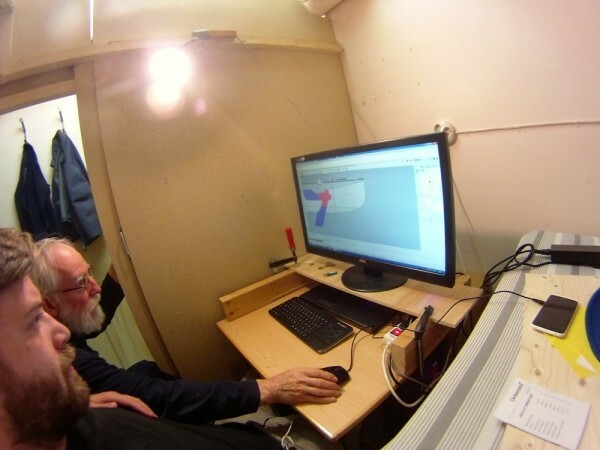 Above: Me and Pierre looking at the coordinates from a rhinofile of the hull a friend has done. 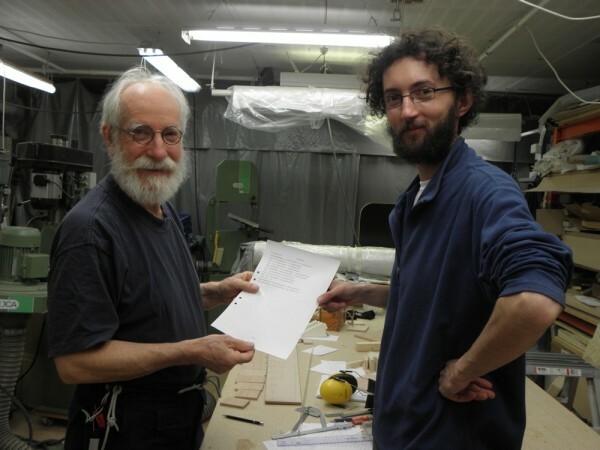 Above: Me and Pierre busy plotting out the coordinates for hulls; scale one to ten of the new boats. I am now in Landevennec, Finistere, Bretagne, France. The reason; I have found an illustrator for my new book which I try to get published in english and french. His name is Pierre Hervé, a well known nautical illustrator. Now we just have to keep working and find translators.